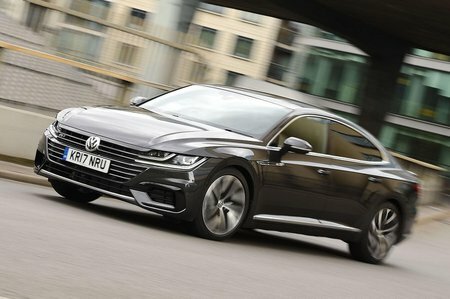 Volkswagen Arteon 2.0 TSI Elegance 5dr DSG 2019 Review | What Car? What Car? will save you at least £4,966, but our approved dealers could save you even more. It may be the entry-level trim but look what you get: LED headlights, adaptive cruise control, 18in alloy wheels, four-way electric lumbar support, swish ambient interior lighting, nappa leather seat trim, front and rear climate control, heated front seats, a 12.3in digital instrument display, automatic emergency braking, lane departure warning and traffic sign recognition. On the infotainment side, you get an 8.0in touchscreen with a DAB radio, Bluetooth, sat-nav, Apple CarPlay and Android Auto, an SOS emergency call response and online connectivity for live traffic, weather and parking space availability.